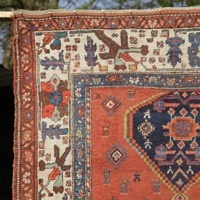 I had lost interest in rugs for a number of years, having eventually sold the small pile in my room which I had to turn over frequently in fear of moths. 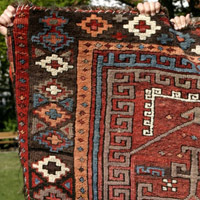 So I was left with just a few rugs that fitted on the floor. 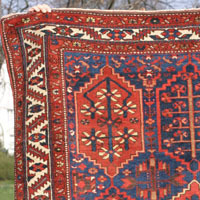 I remember talking to Ian Bennett on the train from Salisbury back towards Bath about rugs, his obsession, his Baluch collection while in charge of pottery at Sothebys, his Persian wife, their large flat, his loss of everything. 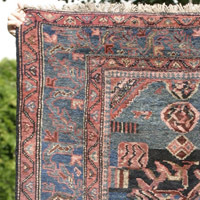 I remember stories of splendid Chinese rugs that were ruined by the parties of Hollywood stars like Myrna Loy, and later bought back in tatters by the same dealer that once sold them in a perfect state. 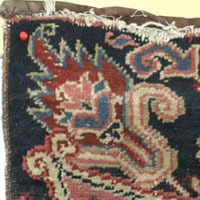 Of thrilling finds and acquisitions (Michael Franses cutting out a very old dragon rug fragment from what had been woven much later around it, straight at the floor of the rural auction house). 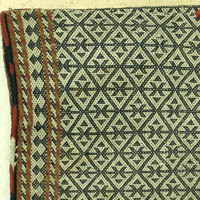 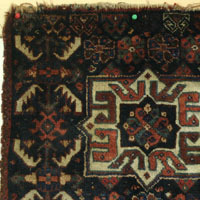 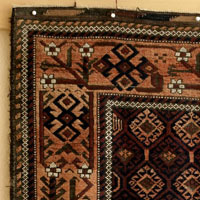 Of the famous Sanguszko carpets. 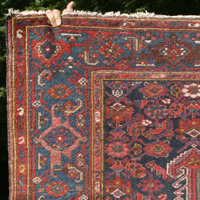 There was an entire world without bottom to discover. 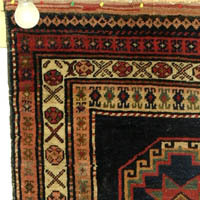 And for some weird reason I later even followed Ian in getting interested in watches instead of rugs. 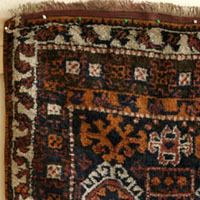 And I have no idea why all this is so important to me. 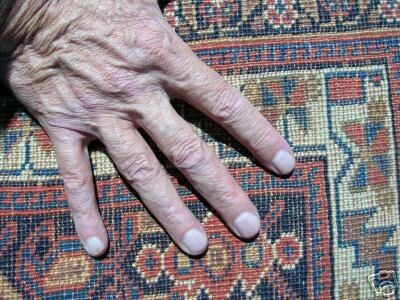 By the time I wanted to return with a microphone, Ian had already died. 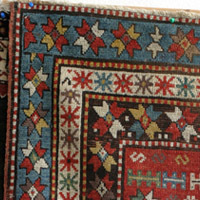 Recently, my interest in rugs has returned. 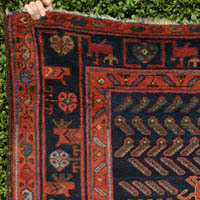 Again I feel the thrill of searching for rugs that interest me (and the thrill of buying some.) 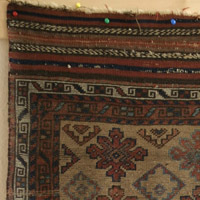 I also still sometimes feel the numbness and dissatisfaction that I have described at length in the negative introduction. 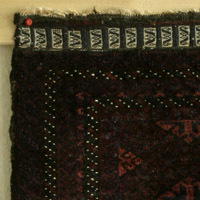 I now think of picking up the habit of photographing and analysing the pieces I get (or that run though my hands) as I did years ago. 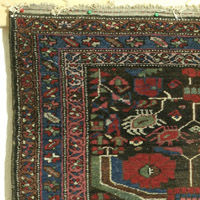 (gone) Bakhtiari, palmette design, 19th c.
(gone) Qashqa'i Shekarlu subtribe - Luri? 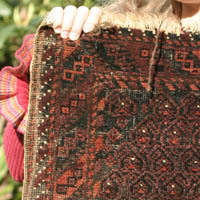 Khamseh? 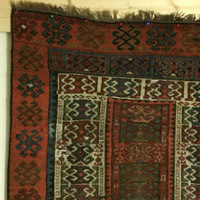 (gone) Luri / Lori Khorjin face, end of 19th c.
(gone) Khamseh Baharlu runner, last quarter 19th c.
(gone) Jaf khorjin (saddle bag) face, depressed, 19th c.
(gone) Kurdish rug, Jaf? 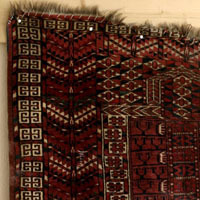 Quchan? 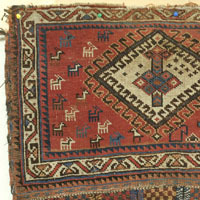 19th c.
(gone) Kurdish Sofreh, NW Persia, animals, camel wool? 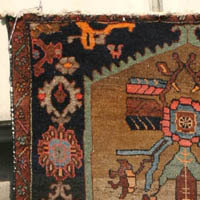 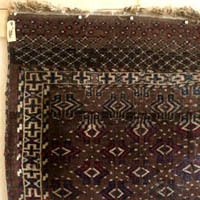 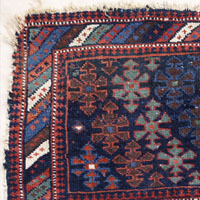 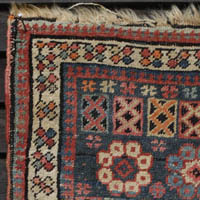 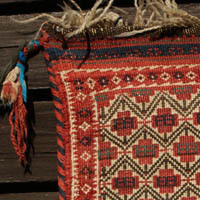 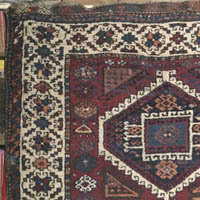 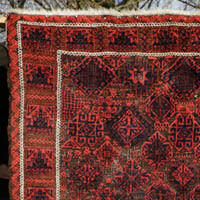 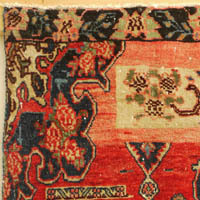 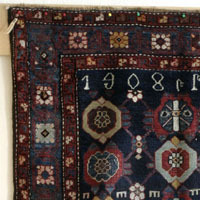 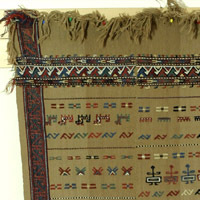 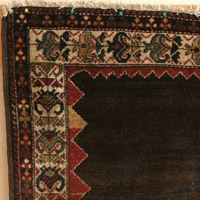 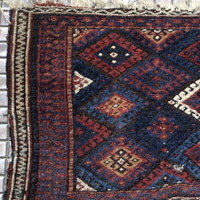 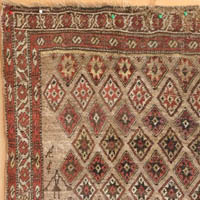 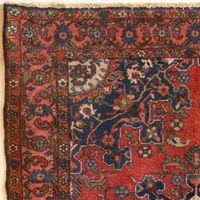 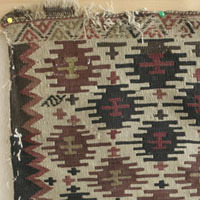 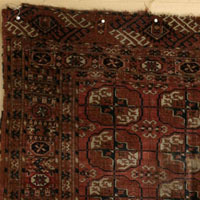 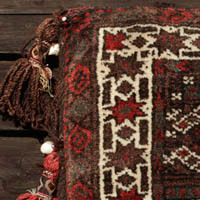 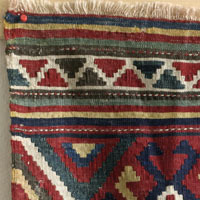 (gone) Hamadan wild herati rug (nomadic production)? 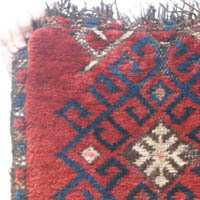 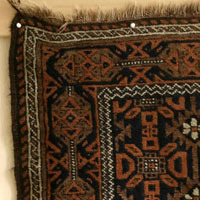 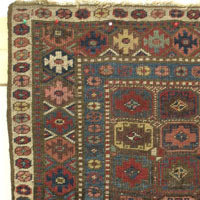 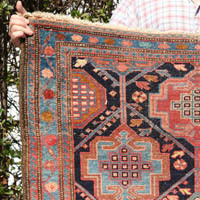 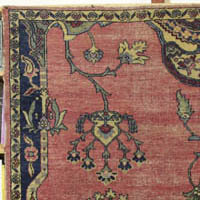 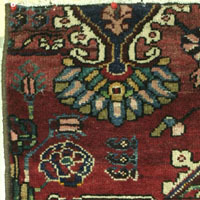 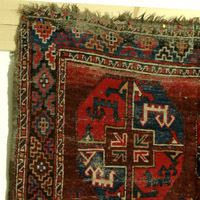 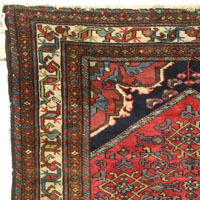 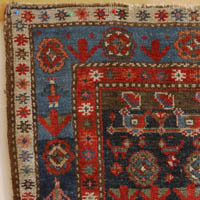 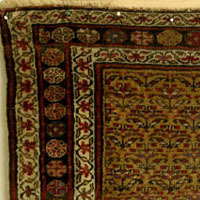 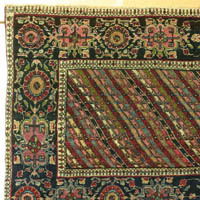 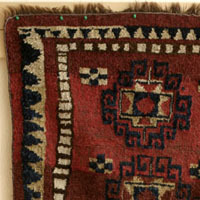 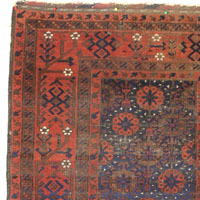 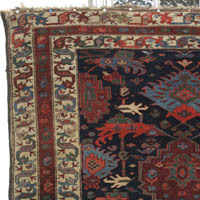 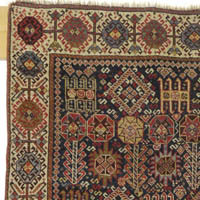 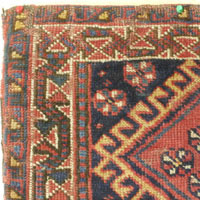 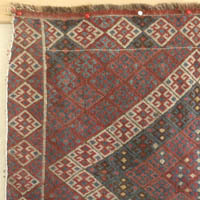 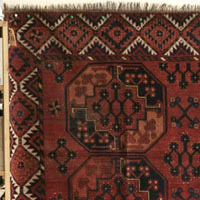 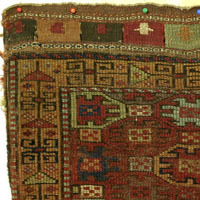 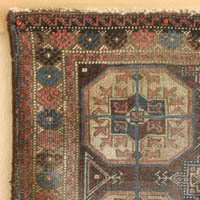 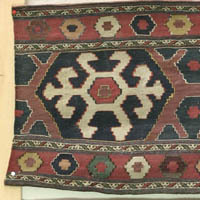 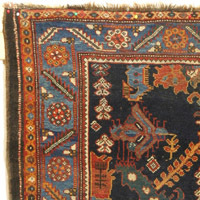 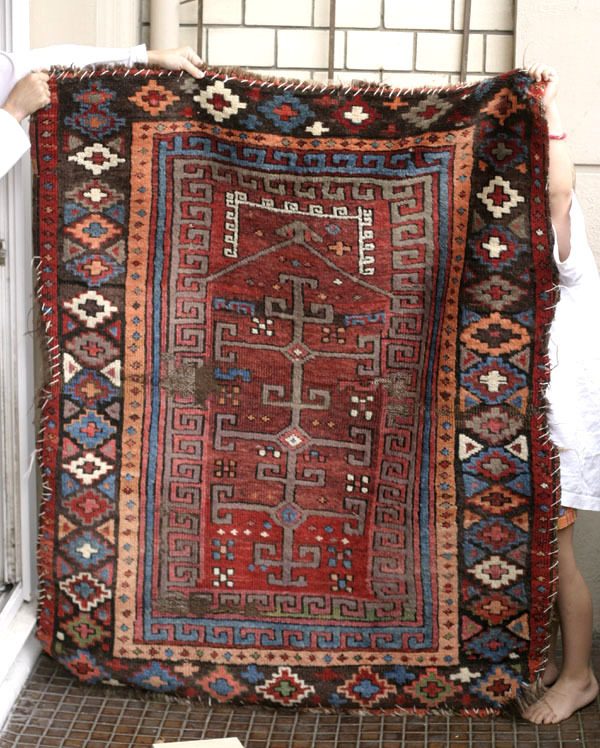 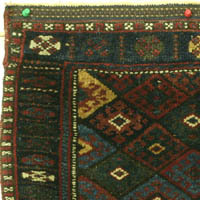 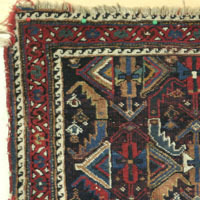 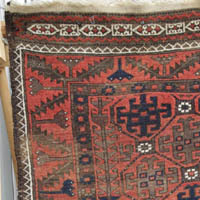 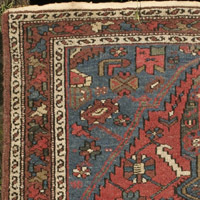 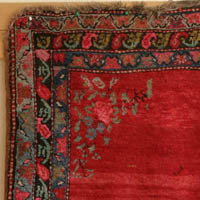 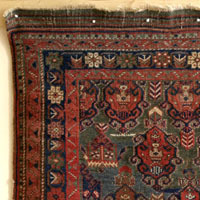 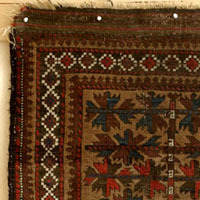 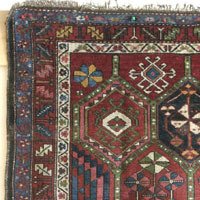 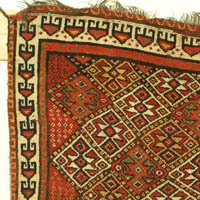 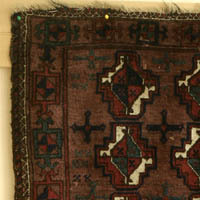 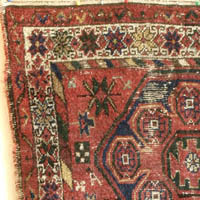 (gone) Small Kurdish Kazak, second half of 19th c.
(gone) Caucasian Fachralo double niche long rug – Armenian? 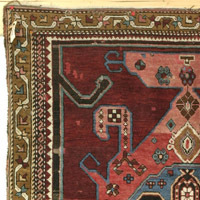 (gone) Tekke Turkmen dip khali, last quarter 19th c.
(gone) Ersari Turkmen main carpet, 2nd half 19th c.
An obvious, if somewhat corny, title for a book on the madness of rug collecting would be "Confessions of a rug addict". 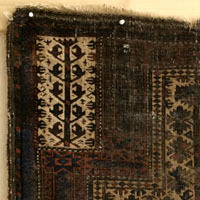 The book would be written like a retrospective of a ruined life (in what way ruined is not so clear). 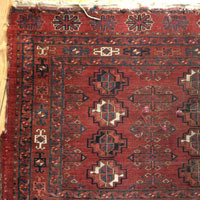 Somehow the leading character would end up lonely, rejected by family and friends after squandering a large inheritance, living in squalid conditions. 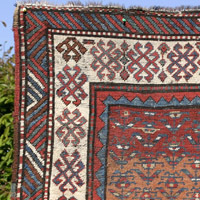 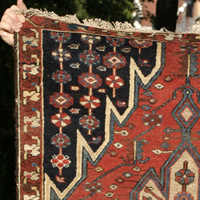 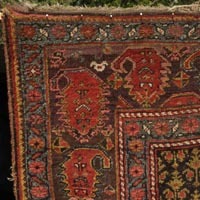 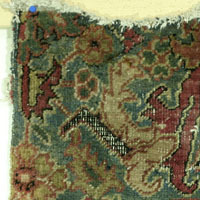 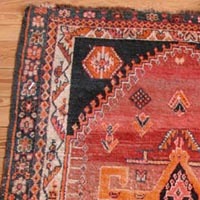 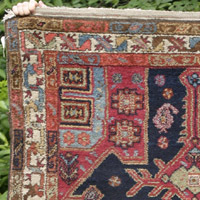 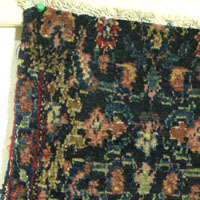 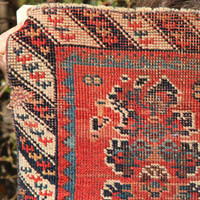 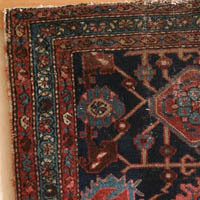 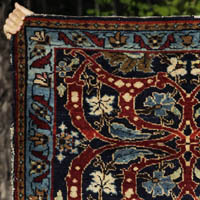 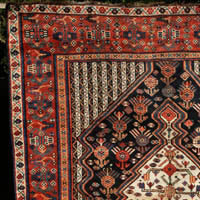 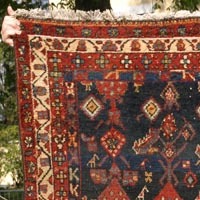 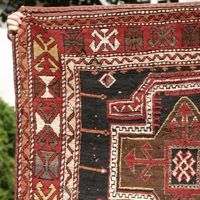 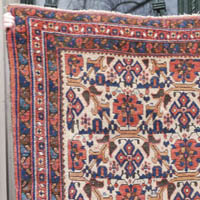 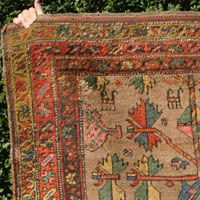 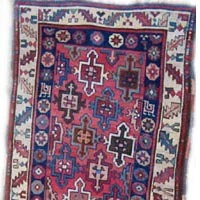 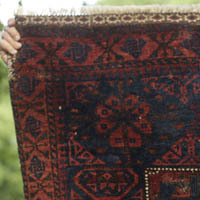 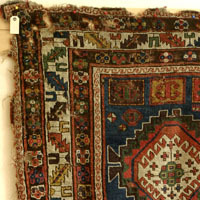 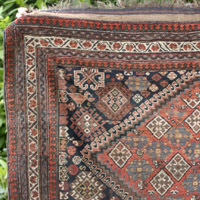 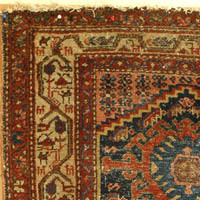 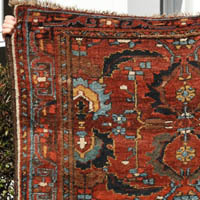 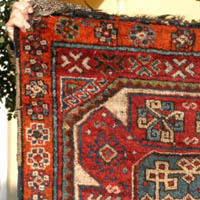 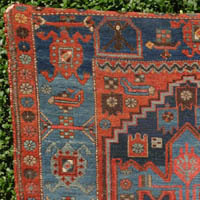 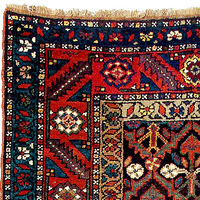 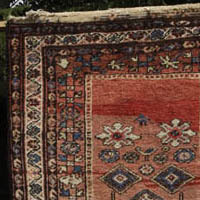 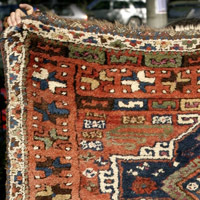 Most or all of the rugs would be gone - stolen, ruined by moths or a freak event or lost rather than sold. 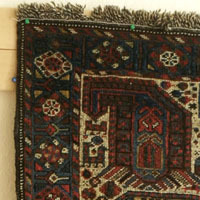 Perhaps the character would have retained one small tattered kurdish prayer rug on which he would also try to sleep. 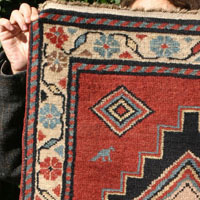 My kids holding up an Anatolian Kurdish prayer rug to be photographed. 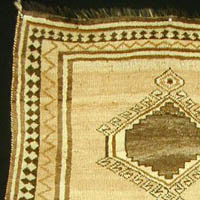 It has quite obviously been used for a long time, so where the knees and feet go during prayer, there are bare spots (especially on the right side. 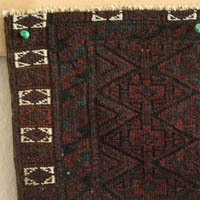 I have no idea what might account for the asymmetrical wear). 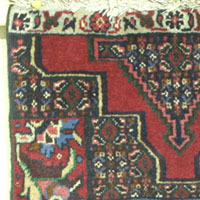 The intense colours and the soft wool are hard to describe. 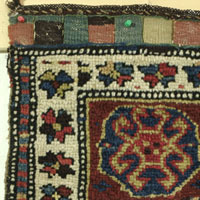 I especially like the way the square hooks adorning the white border that frames the mirhab are treated in the corners.